Running a rapidly growing furniture manufacturing company, and being one of the two in a “two-man shop” left me little time over the past year to expand our current product line to include several new designs we’ve had brewing. Two of them required a bandsaw upgrade, which meant that I would need to overcome both a time and finance scarcity in order to bring the new designs to life. I needed a bandsaw with the capacity to resaw 8-12” stock for bookmatching, with a maximum cut height of 12-14”, for creating an arc to become the seat of a chair or stool. My existing setup limited me to a 6” cut height, so I knew this upgrade would be quite a jump. The Jet JWBS-14SF bandsaw was a perfect fit. Most bandsaws on the market that offer a sufficient cut height are high dollar 18-20” bandsaws. I had resolved to watch Craigslist and wait. A month or two into my wait, I learned about the new Jet JWBS-14SF bandsaw. It seemed like it had the capacity I was looking for, along with some pretty enticing features, yet was also affordable! I’d never purchased a Jet tool before, but their reputation is solid; they’ve been around over 50 years and producing woodworking tools for at least half that. So I took the plunge! I love getting deliveries (Hi, I’m Jon, I’m an Amazon prime addict. It’s been 4 days since my last order…), especially deliveries that arrive on a freight truck. When I heard that horn blast out in front of my shop, I was in my forklift and at the back of the trailer before the driver was even out of his cab. It’s exciting to get a new tool, especially a large staple piece, such as a bandsaw. As soon as I set the pallet down just inside the shop, I opened everything up to give it a once over. Not a scratch. A+ on packaging. Bolt on the feet, click a handle in place, lower the table, attach the fence (wow, I’ll get back to this in a minute), and we’re ready to… daggum… this thing is heavy! We probably should have dropped the pallet a little closer to its permanent location. While moving the JWBS-14SF into place, I noticed how well the weight is distributed; it’s offset in a manner that makes it near impossible to push over when you’re shoving even the largest of timbers into the blade. At the same time, the footprint is small enough to where I didn’t have to consider rearranging my shop. Before plugging in the Jet JWBS-14SF bandsaw, I went through all of the settings, most of which were already spot-on from the factory. Tensioning and tracking the blade and setting up the guide bearings are each COMPLETELY tool-less tasks. I’m accustomed to loading up a cart with Allen wrenches, combination wrenches, a handful of screwdrivers, a small socket set, and some MANd-aids (paper towels & electrical tape) for my knuckles anytime I’m setting up a bandsaw, or even just changing out the blade. With the Jet, my pointer fingers and opposable thumbs, as well as a machinist’s square, were all the tools I needed to do the job. All of the adjustment knobs are knurled, so they’re easy to grip and tighten. And with the 115V power cord pre-wired, we were ready to plug in and cut some wood after only 5 minutes! My first task was to run a few test pieces through and check the Jet JWBS-14SF bandsaw setup. I started by cutting some thin veneers from various species of woods, ranging from 8 to 12” high. I was surprised by the ½” stock blade’s cutting ability, considering it’s a universal blade. 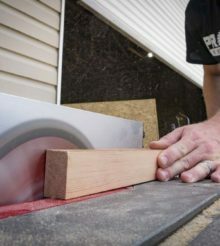 I was cutting very smoothly with no blade drift at all, on soft and hard woods alike. However, since I intended to primarily use the saw to near-maximum cut-height, I needed the heftiest resaw blade it would fit. After scouring the internet without satisfaction, I went to my local sharpening shop to get the blade made. I’ve had good experiences with all the bi-metal blades they’ve made for me so far, so it was worth the wait to get a ¾” 2-TPI hook blade. While waiting on the new blade to be ready, I had time to build my radius jig and tackle some smaller projects with the new saw. Working on the Jet JWBS-14SF bandsaw is completely different than working on your run-of-the-mill 14” bandsaw. The sturdiness of the steel frame and rock-solid four-sided blade guard leave no doubt—this is an industrial-grade saw. I’ll admit it—I had some initial reservation about the 1-¾ HP motor. Most bandsaws with the resaw capacity of this one incorporate 2-3 HP motors, but the JWBS-14SF motor doesn’t bat an eye. I haven’t experienced a lack of power at all. Another highlight for me is the dual-position fence system. For ripping, you can turn the fence sideways for easy material access; and in the vertical position, you have a solid 6” fence face to brace your work piece against when resawing. The micro-adjust feature dials in precisely and is beneficial for cutting veneers. The laser-etched fence scale means you’ll never wear off the indicators. When you compare it to other tool scales in my shop, you can see why this is a notable feature. The location of the dual-dust collection ports keeps the entire working area free from the 4” hoses. The overall design of the saw is inherently familiar, which means it’s easy to operate. When my new blade arrived, I was ready to run a pile of wood through it. The blade change-out was tool-less, and quite simple. I removed the table block, opened the upper and lower doors, opened the upper and lower blade guards, swung the quick tension lever to “full release,” and pulled the old blade out… all in all, it took less than a minute. I did the reverse to install the new blade and with the tool-less tracking and guide-bearing setup, the new blade was once again, readily dialed-in. The blade was exactly what I needed: fewer teeth in contact with wood at the same time. That meant a faster feed rate with smoother results. Still with no blade drift, it cut very straight. The whole experience was really solid. This is a big-boy industrial-strength bandsaw, with the small footprint of a 14” consumer-grade bandsaw. My results are fantastic and I couldn’t be happier. It’s worth mentioning here that it doesn’t have a foot brake. My previous bandsaw didn’t have one either, so it was a feature I was hoping to gain in the upgrade. Having said that, it’s certainly not a deal-breaker. As I mentioned above, this is my first Jet tool experience and I’m thoroughly impressed. This will not be my last. The simplicity of design, attention to detail, and components quality have certainly earned my respect. For my needs, Jet really hit the nail on the head with the JWBS-14SF. It has the resaw height I was after, without the expense and footprint of the 18-20” bandsaws. At $1,899 it’s a well-priced tool, considering both the capacity and features. You can find off-brand bandsaws with similar specs, and maybe save a couple hundred dollars, but I wouldn’t suggest trading the Jet build-quality, for a small difference in price. Chief designer & fabricator of Seventeen20, Jonathan is a professional musician turned furniture-maker. He's spent the last 17 years twirling drumsticks for multiple bands including Copeland, States, and Anchor & Braille. His affinity for industrial modern design has been inspired in-part by his travels, though his current inspiration comes from his biggest project in recent years: the total rehab of a 1970s split-level suburban home in Central Florida. Sorry for this price I can get a Rikon with more than 1 speed!! Jet get with the program, if you are going to sell this bandsaw it should have at least 3 speeds at this price point!!!! !